Taking a canoe out on the water sounds like a wonderful experience filled with epic sceneries and breathtaking wilderness, until the time comes to actually get into the canoe. Don’t let the fear of turning over keep you from trying. 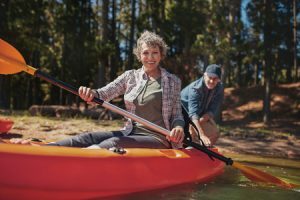 Here are some canoeing tips to help you not tip over and have an experience of a lifetime in Ontario! Canoeing is all about keeping your balance from the moment your foot touches the floor of the canoe to the moment you’re stepping back onto the deck. A high center of gravity is to blame for a tipped canoe. This occurs when your weight is higher up and therefore makes it easier to lose balance. So when you’re standing and entering a canoe, you don’t feel like you’re in control until your body is fully lowered. Physically, it’s important to place your foot directly in the middle of the contraption and maintain that stability while placing your other foot in. Remember to utilize the sides of the canoe to help, or even a nearby friend that is willing to take a dive if you really lose your balance! Anyone who has ever canoed has probably found themselves stuck against a rock at some point during their canoeing adventures. This is a tough situation to get out of, but it’s not impossible. If found in this situation, remember to lean downstream. Leaning downstream will help you get unstuck because it will counteract with the force of the water that’s trying to tip you upstream. You will come across many obstacles while on your canoe, like that rock you could potentially get stuck on, or trees off the shoreline. Though your first instinct will be to grab a hold of the branches or push off the rock, you shouldn’t! Touching these objects will actually cause you to become less balanced, and then consequently go overboard. Keep your center of gravity in your canoe as low as you can when you come across these obstacles instead, so that you maintain your balance and continue your journey in dry clothes. Are you ready to plan your canoeing adventure? Come experience the true beauty of the Northwestern Ontario wilderness at Mattice Lake Outfitters. We offer various canoe trips in Wabakimi Wilderness Park as well as the Albany & Kopka Waterway Parks. Give us a call at 1-800-411-0334 or email us at mattice@walleye.ca to learn more about our canoeing packages!